Throw the distance! This All-Terrain Slinger is the right choice for sites where multiple loads are required and the material can be staged on site. Four wheel drive and radio remote control get you to diﬃcult to reach areas oﬀ road, around buildings, or behind obstacles. The All-Terrain is a popular slinger due to its unique ability to handle jobs of all types and locations. Remote Access. With its radio remote controls and dual speed tracking, the All-Terrain is easy to maneuver in limited access areas. Using all-wheel drive and 3-way steering, you can position the All-Terrain for work then stand at the best vantage point for your safety and accuracy. Adjustable Leveling. The All-Terrain has an automatic tilting feature that keeps it level even on slopes to provides stability and continuous feeding. On-Site Loading. At six feet high, you can load the All-Terrain from the rear with a small skid steer or from the side with a larger loader. Extreme Accessibility. The All-Terrain has all-wheel drive and Oﬀ -Road Traction Floatation Tires for oﬀ road mobility. 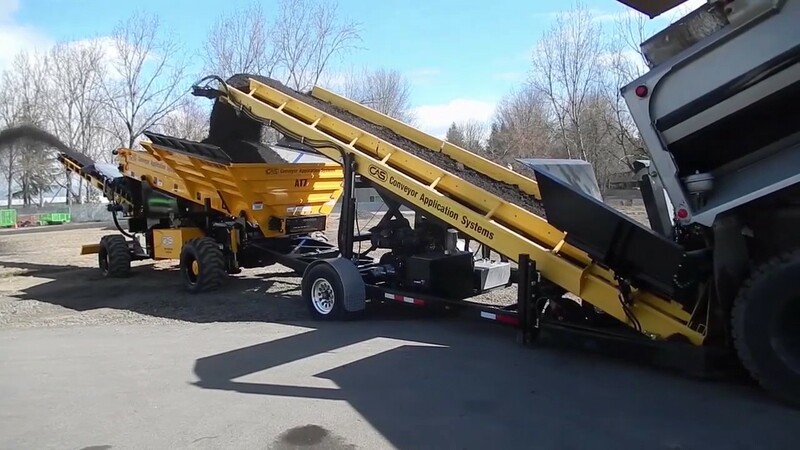 All Terrain Slinger, quality steel construction, 22′ x 8′ x 9′, 7 cubic yard capacity steel hopper, 14′ long shot belt, Caterpillar C6.6 202HP Tier 3 Engine, 2 Speed Direct Hydraulic Drive; 18,000 lbs.